The principles of a single point ground system are well covered in ARRL’s lightning protection page. First is to identify everything coming into/leaving the house. In my case, that includes the POTS telephone line, the cable from Comcast, the irrigation system wiring, the house ground itself (more about this in a separate post), power to the pool shed and power from the power company. Since I’m not a ham, I don’t have the additional complication of an antenna and its controls. In a small house or apartment, a conventional UPS with protection for cable, telephone, and power may very well be all you need in a simple environment of co-located equipment . I’m not very happy with the single UPS idea, since if any single component fails, you get to replace all of them, and it’s not clear you can easily detect if a component fails (nor what the quality of them are). My house makes life hard; there is a big chimney mass so that I have to run multiple 802.11 access points to get coverage, and I therefore had to run quite a bit of cat6 cable to solve this problem. The length of time to do backups given current disk sizes also argues against complete reliance on wireless. I’ve had the most failures in my cable modem due to lightning. For me, therefore, a prerequisite was getting Comcast to move the cable, which had been mis-installed on the front of the house, causing a 60′ or so separation from the wire entrances. This was a major adventure that I may blog about later. After a couple months of effort, I succeeded in getting them to move the cable entrance to near my power and telephone entrance but not until after the most recent and most expensive lighting event, despite having started trying to get them to do so well before the event. The ham radio industry is the usual hobbyist racket on prices. You can often do better on prices if you shop around: other companies specialize in serving the larger radio station and mobile radio markets. I found a company Georgia Copper was useful for some of what I needed rather than paying the inflated prices for companies catering directly to the retail ham market, particularly for what I needed for my grounding project. This is not to say that the companies catering to the ham market are bad; and Polyphaser in particular is well known and from all accounts sells good stuff that you’ll find in all the reputable RF industry suppliers, just that you can spend a lot more than necessary if you don’t shop around, particularly for joint compound, copper strap and ground rods. 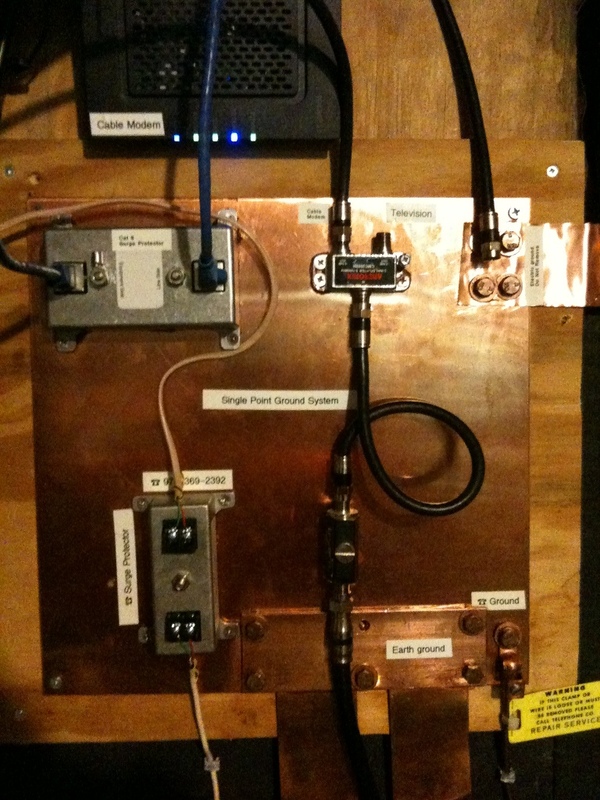 I had space between several power panels to mount the single point ground system, which is based on a 12″x12″ copper plate. Feeling poor (due to having to replace so much gear), I ordered a copper plate of the right thickness (.065″) via Amazon for $30, rather than getting the fancier premade ones you can get for the ham market. Note that the Polyphaser equivalent is about $200, but does include a lot of the ancillary stuff you’ll need, including the anti-corrosion joint compound goop, a some copper strap, and clamp to attach the strap to your main house ground, so my actual savings was probably only a bit over $100. Thinner copper would probably have made it impossible to tap the screw holes. Hams like spending on their hobby, and will often spend much more than they need to; this is common behavior among enthusiasts. There are various flavors of these devices: having been burned so much, I got better than usual versions, along the lines of what a ham or radio station might invest in. Even so, they aren’t all that expensive. Note that you want “fail dead” devices, that self-sacrifice, and that they come in a number of flavors, that have different characteristics around how fast they react and how much energy they can absorb. Some of these kinds of protectors may have replaceable neon bulbs that die upon a strike. The copper plate for mounting the protection devices is thick enough that I tapped holes for machine screws. Others may find it easier to use sheet metal screws. All the protection devices and the copper plate they mounted on were carefully cleaned, and were mounted using special anti-corrosion joint compound “goop” that also has conductive particles of copper in it. You want to use stainless steel or bronze in any fasteners, rather than the usual galvanized steel (bronze is best, but hard to get particularly in small sizes). You don’t want to have to come back years later and find electrolytic corrosion has done in your careful work. Amazon turns out to be a good source for stainless machine screws and hardware; they apparently do a good business for industrial, research and development shops. Here’s a picture of the resulting single point ground system after initial installation, but before completion with the new house ground and telephone line hooked up. The upper left hand corner is a Cat6 Ethernet protector, wired on the outside port of my cable modem and connecting to my internal network. The slightly smaller protector beneath the Ethernet protector, not yet wired in this picture, is for the incoming Verizon telephone line. The incoming cable from Comcast is the black cable in the center, and it is protected by a smaller black device with replaceable bulbs; its output goes up to the cable splitter to connect to the existing TV cable wiring in the house and the cable modem (the upper black box with all of the LED’s lit). 2″ wide .022″ thick copper strap is bolted on the upper right corner, and goes over to the house ground, which, until augmented a few days ago, consisted solely of a large thumb size copper cable that runs across the entire width of the house and is bonded to the house’s well casing. Things I’d do differently if doing it again: I mounted the telephone and cable protectors a bit low on the copper plate. This caused some problems mounting the strap to the new house ground I installed last Friday and ideally, I should have mounted both a inch higher. I also don’t like the bolts and washers holding the ground strap down, so I used a piece of copper plate for the new ground system. The strap to the old house ground cable goes off at the upper right due to mechanical constraints of where I could mount the ground plate; ideally, you’d prefer to keep all the ground straps nearer the bottom. Why copper straps? I’ll discuss that in my next blog entry about the new grounding system I installed. This entry was posted on August 29, 2010 at 1:15 pm and is filed under Lightning. You can follow any responses to this entry through the RSS 2.0 feed. You can leave a response, or trackback from your own site.